COMPASSIONATE CLIMATE ACTION: 156 Days - Let Me Tell You About My Electric Bike! 156 Days - Let Me Tell You About My Electric Bike! H. G. Wells once said, "Whenever I see an adult on a bicycle, I have hope for the human race." Well, how about when you see a middle-aged and out-of-shape adult smiling and laughing while she zooms down and rockets up the hills on her new electric bike? I know there are tons of issues with my new electric bike (where it was made, how far it had to be shipped, blah, blah, I'm too happy to care right now! ), but I am finally cycling again. I live on a very hilly island, and once I let my fitness level fade away, I never thought I'd be able to ride again. So now I'm getting in shape again while still making it up those hills without having to get off and push my bike up along with my sorry body. And fun?! Oh yeah! Our bikes are electric-assist, which means that we still have to work at it, but now we get some help on the inclines. Back at 170 Days, I suggested Compassionate Climate Change Action #6: Get ready for alternative transportation. Well, I'm ready now. Looking at buying one of those bike trailers, too, so that we really won't have to use the car anymore. 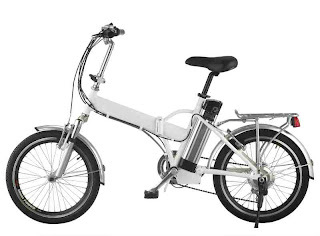 So, if you've been thinking about buying an electric bike, do your research (I'm not going to make any recommendations; we already had to send one model back) and go for it. I bet you'll have as much fun as I'm having.